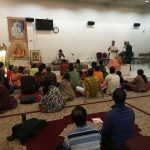 On the afternoon of October 20th 2012, Sri Ramanujamji spoke on the essence of Srimad Bhagavatam at the New Hampshire Hindu Temple in Nashua, NH. During the 80 minute discourse, Sri Ramanujamji underlined the sweetness and simplicity of Bhagavata Dharma. 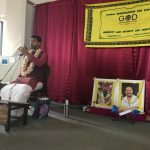 He spoke on how Bhagavata Dharma shows that the goal of Artha (earning) is indeed to uphold Dharma and not the other way round. 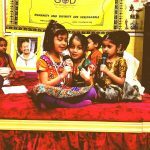 Through beautiful illustrations he showed how grace can make the sail smooth if we don’t obstruct to it, and how Mahamantra Kirtan transforms us into humble receptacles of divine grace. 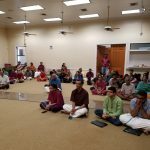 Towards the end, at the behest of the temple, Sri Ramanujamji briefly addressed the young adults and their parents on facing challenges in child’s life. More than 40 children and young adults attended the discourse in addition to 35 adults. 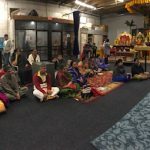 The program was facilitated by the Hindu Temple of New Hampshire.